Could we be hearing an announcement from Joe Curtatone about his bid for Governor soon? One thing we know for sure is that Martha and Charlie are in! Five days remain until the Ward 5 School Committee and Wards 1 and 3 Alderman races are brought down to two candidates who will then face off on November 5. Be sure to learn about each candidate through their website or by talking to them while they are doorknocking. The Somerville LGBT Film Series continues this Monday (September 23rd) with Left on Pearl (work-in-progress). The show will begin at 5:30pm in the Somerville Council on Aging office, TAB Building - 167 Holland Street. The cost is $6 and includes dinner. Please RSVP by calling 617-666-6600 extension 2300 or email lheyison at somervillema.gov. Huge congratulations to Silvia De La Sota! Silvia owns Aguacate Verde located at 13 Elm Street and she was just approved for a beer and wine license at the last Licensing Commission meeting. This restaurant serves authentic Mexican cuisine that includes a vast vegan menu and fresh ingredients in all their dishes. Silvia even features a health eating survey on her website and also hosts live music and a Saturday buffet that has become very popular with locals. Please join Silvia in celebrating her victory on Saturday September 21st as she offers a brunch buffet and live Peruvian music from 11-2:00pm. Mayor Joe Curtatone gave a resounding speech at Alderman At Large Jack Connolly's fundraiser on Monday night, calling out political candidates who are going negative this election season accusing members of the Board of Aldermen of "rubberstamping Curtatone-projects." This is the first time the Mayor has ever taken the issue head-on and it will be interesting to see what type of response it receives. The Somerville News announced a name change this week! The free weekly newspaper changed back to the Somerville Times honoring founder Bob Publicover. 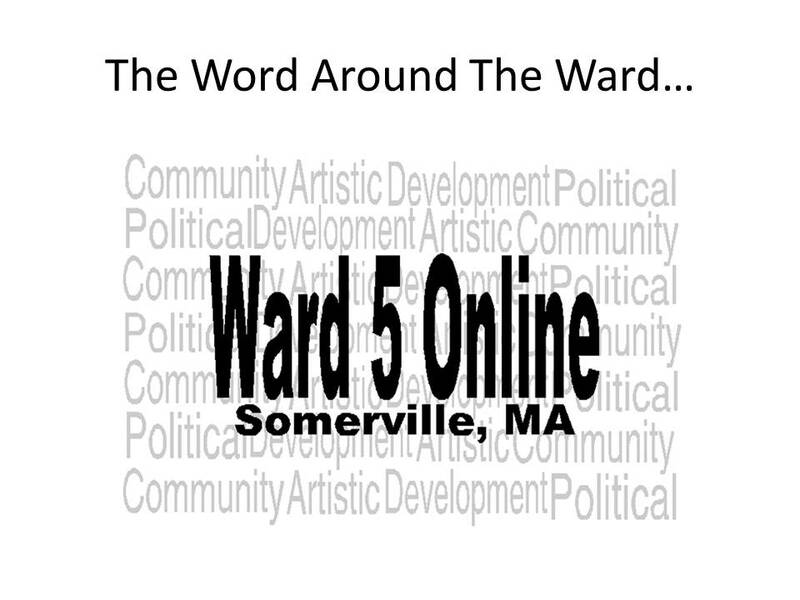 Going forward, Ward 5 Online will refer to the this news source by their new name. Spotted in Magoun Square were supporters of Mary Jo Rossetti who is running for Alderman At Large. A who's who of political candidates, elected and city officials, as well as, Somerville notables came out to kick-off Mary Jo's bid at Olde Magoun's Saloon on Tuesday night. Courtney, did you go to the Joe Capuano kickoff in Ward 7 on Monday? Or the Matt McLaughlin event in Ward 1 on Tuesday? Sean Fitzgerald's kickoff is tonight. Just FYI. Thank you! Due to community meetings, I was unable to make the other events.